This one time - we were harvesting a production bioreactor with several million dollars worth of product - an operator left a valve open and 33% of product went to drain. The plant manager (VP) was fuming mad - rightfully so. "I pay for all this monitoring software, how come no one could tell that a valve was open?" It's a good question. I drifted off thinking that we didn't have a tag for every valve indicating whether or not it was open. 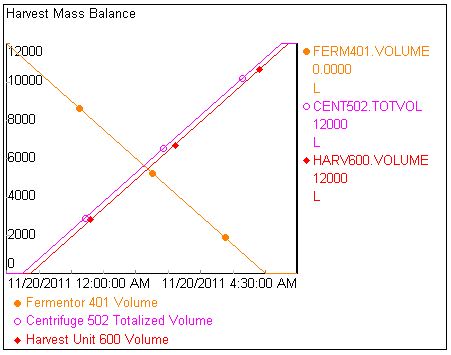 "We need a mass balance," he said to no one in particular. And then I realized we could have a mass-balance since we have load cells on the bioreactor and harvest tank, as well as a flow totalizer on the centrifuge. In the case of biologics processing, we are dealing with constant density volumes, which means that a mass-balance is often the same as a volume balance. The pipes between the bioreactor and the centrifuge holds volume (called "hold-up"), as well, there is hold-up between the centrifuge and the harvest tank. 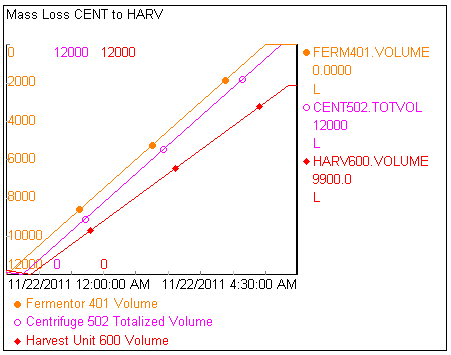 From this perspective, we can easily determine if there is volume-loss between the centrifuge and the harvest unit by looking at the slopes: if the slopes are the same and the lines are parallel, we have no mass-loss. But it's hard to tell if there is any loss of mass between the bioreactor and the centrifuge since the line is downward sloping. This trend shows that the mass is balanced (i.e. no losses in the closed system). But suppose there is a valve open on the line between the fermentor and the centrifuge... what does that look like? 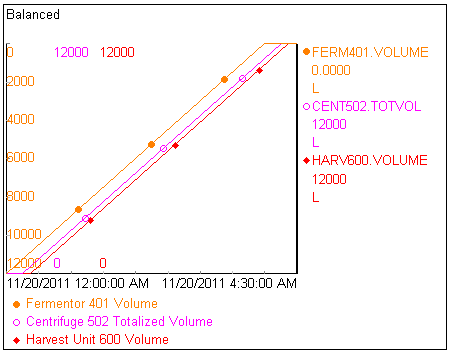 In this case, we see that the slope of the totalized volume processed by the centrifuge is less than the slope of the fermentor. Literally, the rate of volume lost by the fermentor is greater than the rate of volume gained by the centrifuge... the difference is the amount gone down to drain. Likewise, should there be losses just between the centrifuge and the harvest unit, the totalized volume of the centrifuge and fermentor volumes should match in slope, while the harvest unit should have a lesser slope. PI ProcessBook is ideal for monitoring your process... especially if you need to know something in real-time (e.g. "Hey, there's a valve open and it shouldn't be"). In biologics manufacturing, there really is no excuse for having losses like these when we can monitor the entire system and prevent significant (in this case, seven-figure) losses in our operations. This is really very interesting. Using load cells are really helpful to balancing the loads and forces. 100% that are restrict the overload and save from the broken stage. compression load cell and digital load cell are producing accurate output to measure the load cell. Thank you.